……ok, well not actually at MY door but….. I still love the idea. I remember when I was a little girl of about 7 maybe, we used to have a milk-cart drive round the neighbourhood each morning delivering milk. They also used to deliver orange juice, cream, butter and eggs. But my over-riding memory is of a blue and white milk-cart clanging away along the street, ‘Milkie’ in his white trousers, white shirt, blue & white checked apron and blue cap, ringing the bell to alert the ‘housewives’ he was in the area. You had the option of meeting him in the street/road to place your order or just leave your empties at the door with money in and a note to say how many bottles you wanted. It’s quite weird to recall that in those days you could quite safely leave money out overnight in the empty milk bottle and it would still be there the next day. I know it all changed at some point, but I can’t really remember when it was that we realised this was no longer an option……the money ususally got stolen. Eventually in time the milk-carts also went by the wayside and the early morning bell-clanging was no more to be heard. Imagine my delight when I arrived in London/UK to discover that in some areas they still deliver milk to your door. Now, granted, no-one leaves money in the empty bottle from what I have seen, but nevertheless there are places where the empty milk bottle is left out on the verandah at night and in the morning you open your door and voila…..there are 3 or 4 bottles of fresh milk, icy cold, water running down the sides with early morning condensation. 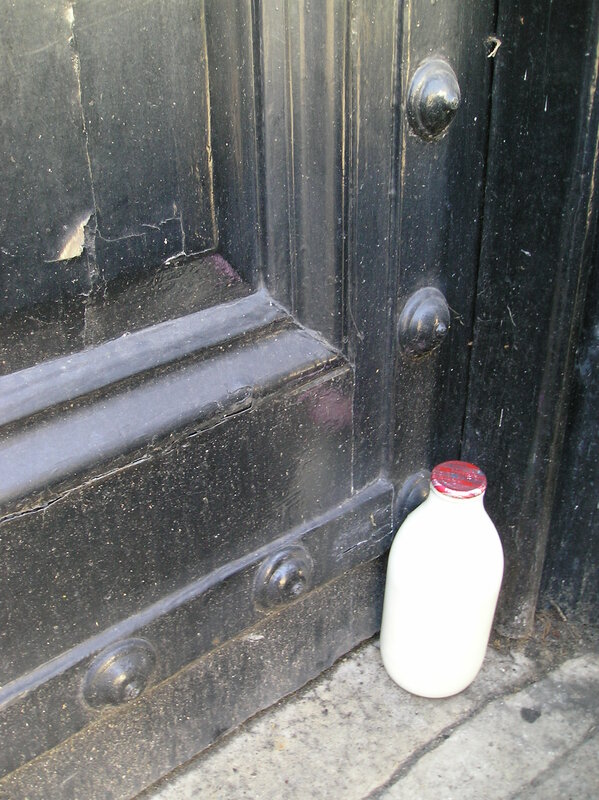 To me there is something delightfully old-fashioned and quaint about having milk delivered to your door.